It’s intriguing, innovative, and yes, in beta, so a work in progress, but if you ask for an invite, I think you’ll enjoy exploring it. Once you have access, you can quickly start creating a Popplet board. This video gives you a brief overview of what Popplet allows you to do. The Popplet interface also gives you many help clues to get started and a quick tutorial when you first try out the site. If you need a refresher, just click the question mark icon at the upper right-hand corner of the interface. Double click anywhere on the interface to add a Popple (the equivalent of a sticky note in other programs). You can quickly change its color to create identifying cues. You can add text (including hyperlinks), images (downloaded or from Flickr or your Facebook album), videos, and even sketches. While you can access a subset of your media options by clicking on a Popple, you have more selection options when you click on the “gear” icon that’s on the interface. The gear icon menu that allows you to add media media from Amazon (e.g., to provide a book recommendation) or a Google Map. When you click on the gear icon, you also gain access to some other tools. 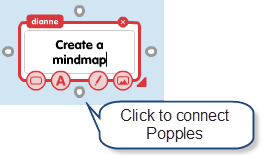 You can use the menu to cut, copy, and past Popples as well as to print or export your entire Popplet as a JPEG file. “Lab tools” are works in progress. The timewarp tool’s particularly interesting because it allows you to see changes you’ve made to your Popplet interface just by moving a slider. The bouncy mode causes Popples to bounce when they touch each other (sorry, no educational application for that one), and presentation mode allows you to display a series of Popplet interfaces. My guess is that the lab feature will be evolving, so I’d check to look for any updates. What I really like about Popplet is the fact that you can add text directly to a Popple you’ve added media to, as opposed to needing to add a separate note. (Contrast Popplet to lino-it, where you would need to add a separate note.) Thus, as shown below, I was able to add explanatory notes to my media Popplets (e.g., “Add an image,” “Add videos from YouTube,” “Add a book recommendation”). An extremely nifty feature of Popplet is the ability to add images and texts from other Web sites to your Popplet board using the Popplet bookmarklet. Just click and drag the bookmarklet to your browser. 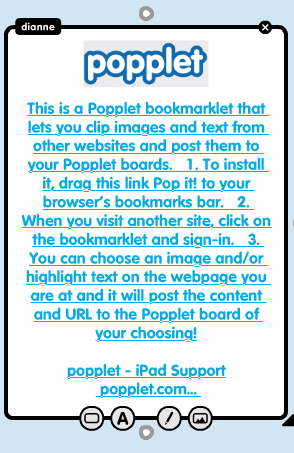 When you see an image or text on a Web page you want to add to your Popplet, just click on the bookmarklet. 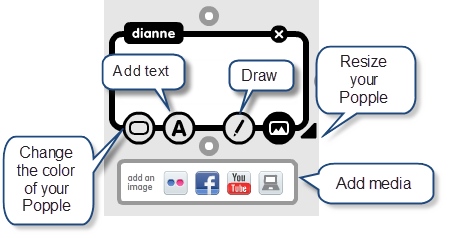 You’ll be prompted to sign in and asked to upload the image/text to the Popplet of your choice. It’s hyperlinked, so you can view the image/text in its original context just by clicking on it. 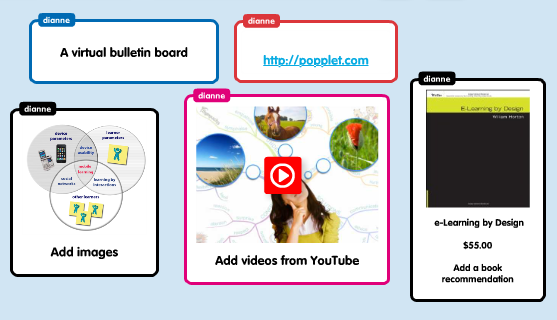 Another nice value-add of Popplet which distinguishes it from virtual bulletin boards like lino-it, Wallwisher and edistorm, is the ability to connect different Popples together. 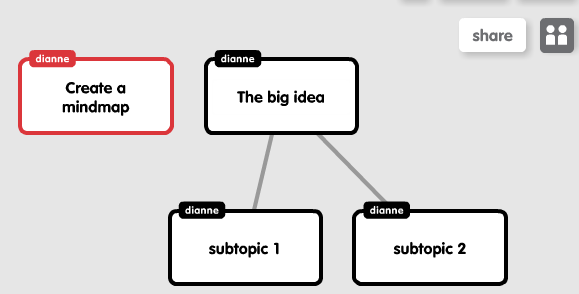 Thus, you can also use Popplet as a mindmapping tool. Each Popple has four different connection points. Your mindmap can coexist with your bulletin board as shown below. Unlike other mindmapping tools, you can add quite a lot of text to each node of your mindmap (though to be fair, other mindmapping tools may have attachment or note features). You can use the Popple color options to highlight relationships between particular nodes of your mindmap. As a mindmap, it’s not as sophisticated a tool as Mindomo, but the ability to create a mind map and a bulletin board of sticky notes, while having access to a bookmarking application has its appeal. As you might have guessed from the fact that each Popple is identified by a name, you can use Popplet as a collaboration tool. 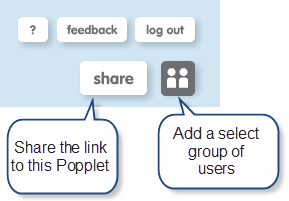 You can share a Popplet with the world or with a select group of users. Is Popplet trying to accomplish too much? Well, you’ll never get that complaint from me, but I do think you have to wrap your mind around the versatility of the tool as you use it. It’s very much worth exploring! Popplet’s currently available in a free “lite” form for the iPad; however, a full version with online sync is reportedly coming soon. This entry was posted in elearning tools, instructional design approaches, Popplet and tagged bookmarking tool, brainstorming, collaboration, collaborative, concept map, concept mapping, edistorm, elearning tool, free elearning tool, Google maps, instructional design, instructional strategies, iPad app, lino, lino-it, mind map, mindmapping, mindomo, Popplet, project management, social bookmarking, storyboard, storyboarding tool, virtual bulletin board, Wallwisher. Bookmark the permalink.